Action Comics is the longest-running continually published comic book in history , and it's the series that launched the superhero genre with the introduction of Superman in 1938. 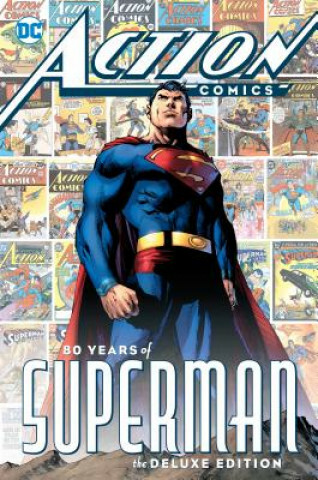 DC Entertainment is celebrating its 80th anniversary with Action Comics: 80 Years of Superman Deluxe Edition, which features cover art by artist and DC Publisher Jim Lee. Join DC in a celebration of Action's amazing 80-year run, with reflections on Action Comics by Laura Siegel Larson (daughter of Superman co-creator Jerry Siegel) and celebrated writers Jules Feiffer, Tom DeHaven, David Hajdu, Larry Tye, Gene Luen Yang, Marv Wolfman and Paul Levitz.Featuring the very first Superman story, the debut of Supergirl, the first stories of arch-villains the Toyman and Brainiac, a never-before-published story from the original creative studio of Jerry Siegel and Joe Shuster, dating back seven decades, and more! Celebrate the hundreds of people who made Action Comics so impactful and culturally relevant for over eight decades with Action Comics: 80 Years of Superman Deluxe Edition.